Oh my goodness. You might think you can't live through this book after the big news that happens early. (No spoilers here). But it turns out you can. It turns out your heart is as big as a giant's, your sense of adventure is still as keen as the wind and Tuesday McGillycuddy might just be the bravest heroine children's literature has ever given us. And Colette Baden-Baden might just be the funniest. This is the third book in this amazing series and like the two books that came before it, it is full of wonder and wisdom, big characters and heart-stopping moments. In Blueberry Pancakes Forever you'll laugh and you'll almost certainly cry, and by the end, you'll know a lot more about what really matters in life and that's the best thing you can say about a book. To be honest, I absolutely adore this series, but I wasn't going to start reading it yet until some of my other TBR books were finished. (Gotta get my PopSugar list done y'all.) Then, I read the inside cover and couldn't stop myself from cracking the third (and final?) book of the Tuesday McGillycuddy series open. Be warned that this installment is much darker than the previous books.This isn't a spoiler, since it happens literally first thing in the book, but Dennis' mysterious illness comes back (I think Banks insinuates cancer?) and he passes away. (<-- That's what was on the inside cover people!!! )The McGillyCuddy house falls into a deep depression. Neither Tuesday or Serendipidity (Sarah) can muster the strength to clean, eat, answer phone calls, or (most importantly) write. Meanwhile the world of Vivienne Small has been plunged into a bitterly cold winter. The world's inhabitants are dying and the cold shows no signs of leaving. Vivienne is taken from her tree house by Lodden, a cruel boy made out of grass. She's forced to pull Tuesday back into the world one more time, but this adventure is unlike any other. Tuesday's life may really be on the line. I've rated the two previous books in this series pretty high. I love the idea that writers go to another world to complete their stories and I love the lightheartedness of the story. This book dealt very well with the depression that Tuesday and her mother felt. (Though it WAS sort of surprising that Dennis died in the first place.) There were a few issues I didn't like much. I felt Collette's character was a bit extraneous. She seems to be there only to move the plot along and have other characters not repeat the pattern of defying the librarian the same way they did inA Week without Tuesday. I guess it was cool that she could understand the Winged Dogs from the very start, but it was a bit unnecessary. As always I find the portrayal of the librarian to be somewhat annoying, but I am perhaps a bit biased about this being a librarian myself. I would never be so brusque with a patron, even a writer in my normal service. I ultimately found Lodden to be the most interesting character of this book. (view spoiler)[He constantly hungers for new stories, but nobody has ever taught him right from wrong. Lodden's imprisonment is both a necessary action and a cruelty against him. How he is dealt with seemed even more problematic, because I couldn't help thinking that there was something redeemable there. (hide spoiler)]Overall this was a 4/5 read for me. Word on the street says that this is the last Tuesday book. Hopefully this is not so, but I look forward to reading whatever the Banks duo publishes next. Huge thank you to Raincoast for this ARC!I am so depressed that the Tuesday McGillycuddy series is completed. This has been one of my "go-to" middle grade series that I love to recommend to kids at my work. It's funny, it's enchanting, the writing is stunning, the characters are delightful -- it's the complete package for any middle grade lover. 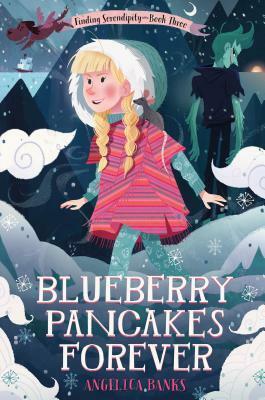 I loved each installment of this series, but reading Blueberry Pancakes Forever was both wonderful and bittersweet all the same.I can't go into too much detail for this review because it is a series and there are events leading into this finale. There's a lot of drama in this book, particularly involving Vivian Small, Tuesday's mother's leading character in her popular children's series. Baxterr the dog also has some awesome moments in the story as well (although let's be real here, Baxterr is always the best). I also love the incorporation of food in Blueberry Pancakes Forever, and we get to see more of Tuesday's family dynamic as well.There's also some very heavy moments in this story. For all this series' humour, there are some gut-punching moments that I know got me as I was reading along. Especially in the first few pages, even! But in all honesty, if you've never read the Tuesday McGillycuddy series and you love middle grade, this is A+, will read again material. If you have a young one who loves magic and fun characters, this series is equally for them. While I am sad that this is the last book in the series, I really cannot wait to see what Angelica Banks has in store next. In the final book of the trilogy, young Tuesday McGillycuddy is stuck in a period of year-long grief (and writer’s block) after the death of her father, and so is her mother, Serendipity Smith (the author of the popular Vivienne Small series). Serendipity arranges for her friend, Colette, to watch over Tuesday, so she can return to the Land of Story to heal and begin writing again. Tuesday is kidnapped by Loddon, her mother’s childhood make-believe character who has gone rogue and buries her in a box under a tree after she refuses to entertain him endlessly with tales in which he is the hero. Without Baxterr, her faithful flying dog, to rescue her, Tuesday must dig deep inside herself to write her way out of this dangerous plot and back into a life filled with love, good memories of her father’s blueberry pancakes, and new stories. This provides a lovely conclusion to a sweet trilogy. We enjoyed the first two books very much, and this made for a strong and satisfying finish. Poignant and thoughtful, especially in dealing with the loss of a spouse and parent, but handled in a gentle, comfortable, and comforting way. The language flows smoothly and easily, in a way that is clear and inviting for young readers or listeners, but it is not simplistic or childish at all. There is clearly a savoring of words and language that is a pleasant treat. This whole series will appeal to anyone who has loved creating, imagining, and writing stories, and to anyone who has fallen in love with a literary world and its characters. It's aimed at gradeschool or middle school children, I suppose, but found it quite enjoyable, myself. Worthwhile reading. Satisfying and warm, whimsical conclusion to Tuesday's story. Very amused by the use of poem rhymes (view spoiler)[ esp when it's used to imprison tiny Loddon into a tiny jar with Vivienne grinning from ear to ear about it (hide spoiler)] and the slight touches of humor. This one felt incongruous with the other two, very disconnected. It was also just a downer and I didn't care to get to know new characters when I'd rather see more of the ones I already liked (Blake, the assistant who's name I don't remember). I think it was a really sad book because Dennis died. It was a little perplexing and confusing. I thought the ending was pretty good, though confusing. I thought that the ending could of, thought be a little more secure and closing, but in the end, it was all good. A truly imaginative story with wonderful characters, and a great writing style. I'm so glad I read this series. I like the original more than this one. The ending dragged on and on. Enough all ready! I think if I had realized that this was book three I would have given this a higher rating. You really can't read this without having connected to the characters in the other books, so I pieced a lot of it together as I read. Sweet story, if slightly tragic. This was a wonderful conclusion to the Tuesday McGillycuddy series. I thoroughly enjoyed the book, although I must admit that I was not entirely happy with the beginning of it. The book begins about a year and a half after the conclusion of Bank's last book, "A Week Without Tuesday". Denis McGillycuddy has passed away from a brain tumor, putting Tuesday and Serendipity into a state of extreme writer's block. Suddenly, Tuesday is swept into the land of story and taken captive by Loddon, her mom's former imaginary friend that eats stories. With the help of her godmother, Colette, Blake Luckhurst, the Gardener, and Baxterr, she is able to escape and defeat Loddon. I think that the theme of this book is "love". I would recommend this book and the rest of the series that accompanies it to anyone who has ever wondered where stories come from. These are always beautiful books. And it's really odd because I feel like I have read this book before, of course I haven't (except that now I have). It just felt familiar and was like coming home.However, this book has a devastating opening. I got to page 20 and ended up in tears (view spoiler)[Denis has died and Brown Street is just not the same without him (hide spoiler)]. But then, we are introduced to Colette Baden-Baden who is a fierce woman! Her and the Gardener are fantastic together plus she understands Baxxter and the other dogs. As always, love this series! This entire series has been such a delight to read, and BLUEBERRY PANCAKES FOREVER is no exception. I love the turn this story takes, loved being back with these characters, and just really felt like it was a fun, unexpected way to end the trilogy.